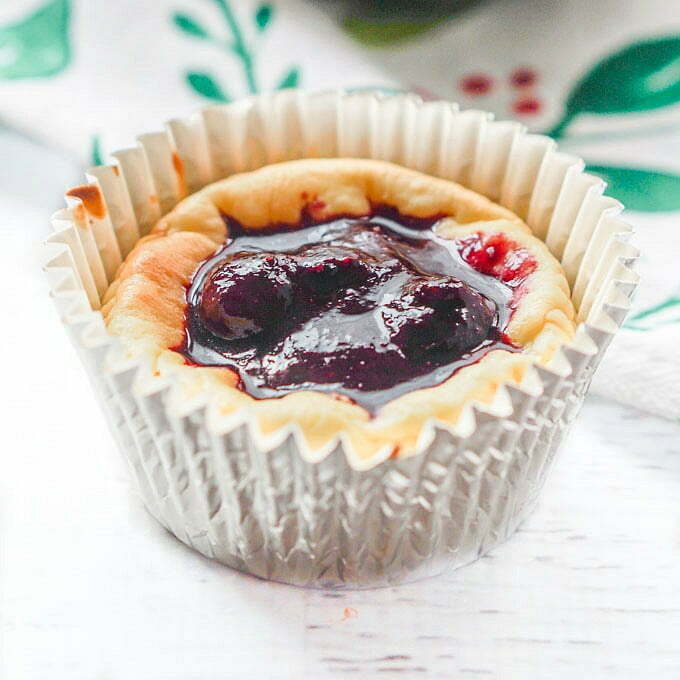 These low carb cheesecake tarts are topped with a sweet blueberry sauce that is perfect for the holiday season. With a few ingredients you can easily make these tasty bite size treats to take to a party or to have on hand for yourself. Only 2.3g net carbs! You will also love this low carb no bake raspberry cheesecake recipe! When I was growing up, we often went to my aunt Mimi’s for the holidays. She always used to make these little fruity cheesecakes in foil wrappers that were of course delicious. So I got to thinking that I could make something similar that would be low carb. So today I have made these low carb cheesecake tarts with blueberries. They would be perfect for taking to a party or even for a sweet snack while on a low carb diet. There are not many ingredients in this recipe. 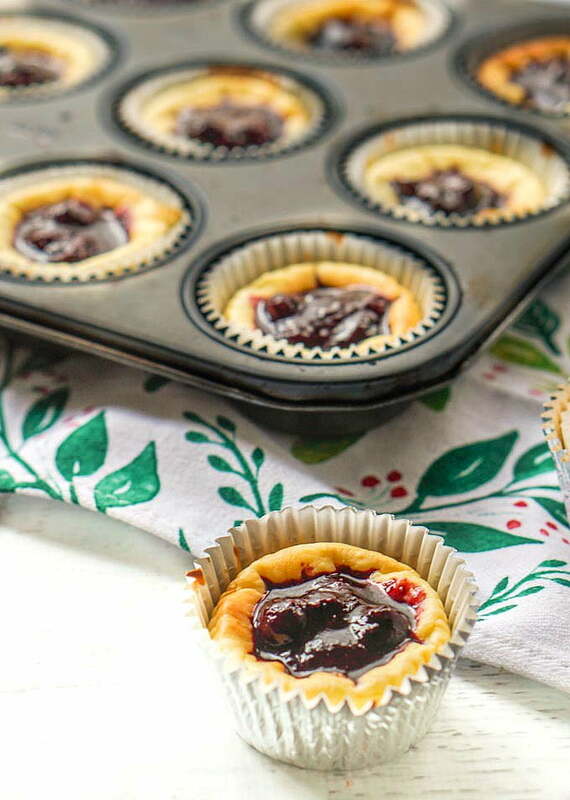 The tarts themselves are made from cream cheese, eggs, Swerve sweetener and vanilla. The blueberry sauce is a simple mixture of fresh blueberries and a little Torani sugar free raspberry sauce for sweetness. Though you could use Swerve sweetener here too but I like the syrup better. Above you can see what they look before and after being put in the oven. To make the cheesecakes you want to mix the softened cream cheese and the sweetener with a hand mixer. Then add in the eggs and vanilla. Whip this up until nice and smooth and creamy. 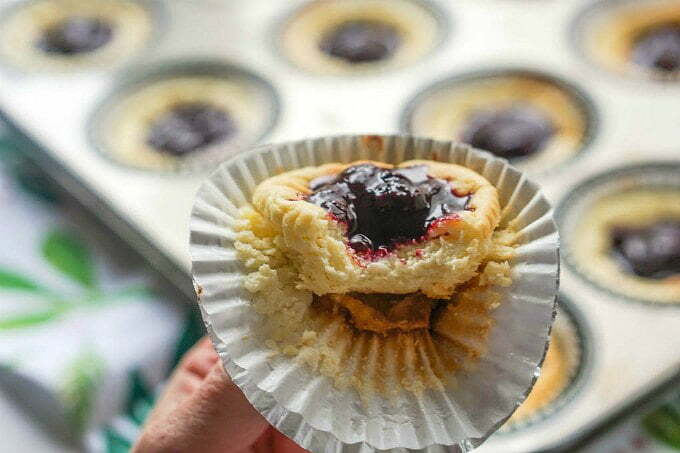 Add paper wrappers to a muffin tin and scoop some of the batter into them. You might have to smooth them out with your finger a bit. Then bake until just golden. This took me 30-35 minutes. This is simply blueberries, water and sweetener. I used Torani sugar free raspberry syrup but you can use more of the Swerve sweetener if you wish. While the low carb cheesecake tarts are cooking, add your blueberries to a sauce pan with the water. Cook for about 5 – 10 minutes until the blueberries have broken down and it becomes thicker. If you are using Swerve sweetener put it in with the water because it will need to dissolve and cook down. If you are using the syrup, just put it in at the end. Taste to see if it is sweet enough and let cool. 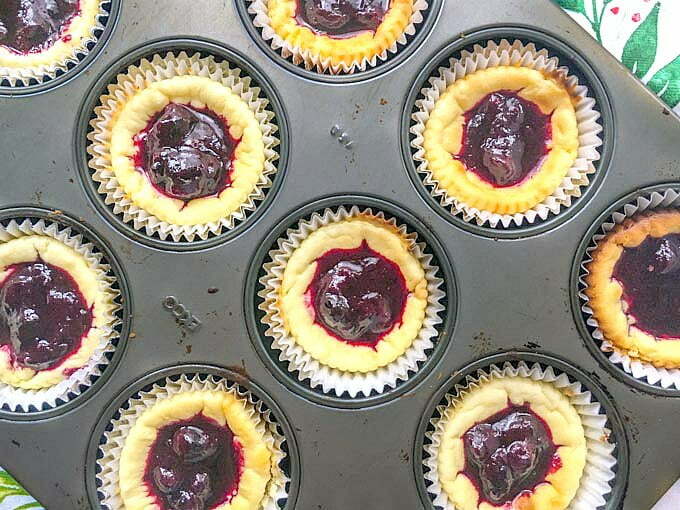 Once the cheesecake tarts are done baking let them cool and then place in the refrigerator for an hour or so. Take them out and add a spoonful of the blueberry sauce. 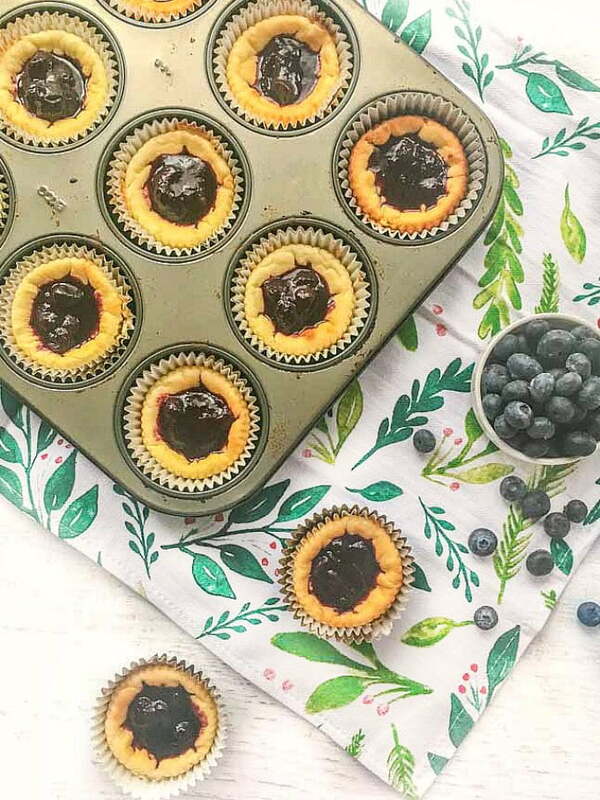 These low carb cheesecake tarts are topped with a sweet and tart blueberry sauce and are perfect for the holiday season. With a few ingredients you can easily make these tasty bite size treats to take to a party or to have on hand for yourself. In a mixing bowl, add the cream cheese and Swerve sweetener. Using a hand mixer, beat until nice and creamy. Next add the vanilla and eggs and mix until well blended. 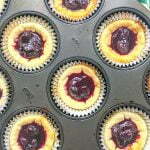 Add foil cups to muffin tin and then spoon mixture into cups. This recipe made 15 tarts for me. Place in the middle rack of the oven and cook fro 30- 35 minutes. Check towards the end to make sure it's not burning but you do want it to set up. Take out of the oven and cool off. Then refrigerate for 1 hour. Meanwhile add the blueberries and water to a small sauce pan. Cook until the blueberries breakdown and create a sauce. About 10 minutes. When done add the sugar free syrup and mix well. Let cool. Then take out the cheesecakes out of the refrigerator and top with the blueberry topping. Keep refrigerated until ready to eat. NOTE** You can use sweetener instead of the Torani sugar free syrup. If so add to the blueberries from the start so it can dissolve and cook down with the berries. What a godsend for those who are on a low carb diet. Heck, I’m not on one and I pick these little tarts for my dessert any day. In fact I prefer lighter desserts rather than heavy and overly sweet. This recipe is a keeper. I bet you make a mean cheesecake Jolina! Thanks for stopping by! I am a blueberry lover. These are right up my alley. Just the right size. In fact, I might have 2 since they looks so delicious. You could eat two and not feel too guilty!